FILE - People walk by the U.S. Capitol in Washington, Jan. 21, 2018, as lawmakers prepare to vote on a spending bill that would fund U.S. government operations for the remainder of the current fiscal year which ends Sept. 30. The U.S. Congress is one step closer to averting a government shutdown Thursday after the U.S. House easily passed a $1.3 trillion spending plan that would end months of the government operating under short-term spending bills. The measure, approved by a 256-167 vote, now goes to the Senate, which has until midnight Friday to approve it and avert the year’s third government closure. The massive bipartisan bill would keep the government funded until the end of September. Lawmakers had just hours to read the nearly 2,200-page bill released Wednesday night. Under Senate rules, a single senator can delay the vote but not stop it entirely. Senator Rand Paul has objected to the short time given to members to read the lengthy legislation. As of Thursday afternoon, the Senate was waiting to see how the vote would proceed, raising the prospect of another brief government shutdown. With midterm elections looming in November, the bill likely marks the final time Capitol Hill will consider major legislation this year. The measure would fulfill President Donald Trump’s vow to boost military funding but provides funding for limited parts of his immigration agenda. The bill, which the White House said Trump supports, would give Trump a huge budget increase for the military, including a 2.4 percent pay raise for military personnel. 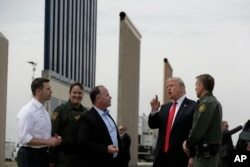 After extensive negotiations between Republicans and Democrats, the bill also provides $1.6 billion for physical barriers and 150 kilometers (93 miles) of a wall at the U.S.-Mexico border, short of the $25 billion Trump requested for the project he repeatedly touted on the campaign trail while pledging Mexico would pick up the cost. “Got $1.6 Billion to start Wall on Southern Border, rest will be forthcoming. Most importantly, got $700 Billion to rebuild our Military, $716 Billion next year...most ever. Had to waste money on Dem giveaways in order to take care of military pay increase and new equipment,” Trump said on Twitter. House Minority Leader Nancy Pelosi touted the agreement in a letter to her Democratic colleagues, saying negotiators “fought for and achieved drastic reductions to the Trump/GOP plan,” including much less funding for the wall than Trump requested and a limit on the number of immigrants that can be detained by Immigration and Customs Enforcement. Democratic Rep. Gregory Meeks said that what the president called “giveaways” were investments in initiatives for military veterans, community health centers, transportation infrastructure and national security. Cataldo Ambulance medics and other first responders revive a 32-year-old man who was found unresponsive and not breathing after an opioid overdose on a sidewalk in the Boston suburb of Everett, Massachusetts, Aug. 23, 2017. Republicans hold majorities in both the House and Senate, but there was not universal support in the party for the bill. Rep. Mark Meadows, a member of the pro-small government House Freedom Caucus, said he would oppose the measure because of “record spending levels” that fund Planned Parenthood and so-called sanctuary cities while falling short on border security and health care reforms. Both parties touted the $4.6 billion in total funding to fight the nation's opioid addiction epidemic, and a record $3 billion increase for medical research at the National Institutes of Health. Speaker Ryan said the measure tackles a number of critical programs, including boosting defense spending and funding for the Veterans Administration, as well as opioid treatment and drug enforcement and improvements for roads, railways and airports. Students from Harvest Collegiate High School stand in Washington Square Park on March 14, 2018 in New York to take part in a national walkout to protest gun violence, one month after the shooting in Parkland, Florida, in which 17 people were killed. Facing growing calls to address recent school shootings, lawmakers also included bipartisan legislation strengthening the federal background check system for gun purchases. The “Fix NICS” measure would provide funding for states to comply with the existing National Instant Criminal Background Check system and penalize federal agencies that don’t comply. Despite Democrats’ efforts, the bill makes no mention of protections for so-called Dreamers, undocumented immigrants brought to the United States as children. 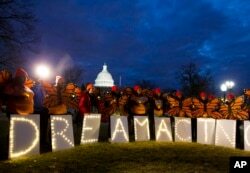 They were protected from deportation under the Deferred Action for Childhood Arrivals (DACA) program that began in 2012. Trump, however, rescinded the program late last year while giving Congress six months to come up with a permanent plan for the immigrants. Democrats had called on Republican leadership to bring to a vote on the House floor a range of proposals that would fix DACA. Federal judges have meanwhile ordered the Trump administration to keep in place certain parts of DACA while legal challenges continue.